I can't say that I've craved adventure all my life. In fact, I was a pretty skittish kid: timid and shy, afraid of everything from vampires to mushrooms. Yup, if there was a mushroom growing in my backyard, I wouldn't go outside. It was that bad. I'm not sure when all that passed, though I guess it wasn't until high school that I started to really thirst for adventure. For danger. For a story like the the ones I read about in my books. One misplaced step, and I'm dead. That's the thought that rung in my ears last weekend. Well, not really. Thinking back, that's probably what I should have thought. Maybe it skittered through my mind once or twice, but the adrenaline kept pushing it away. We were in Ronda, a city in the clouds, most famous for the bridge that spans the Tajo Canyon. It also hosts Spain's oldest bullfighting arena and served as a vacation spot for Ernest Hemingway. In fact, part of Hemingway's For Whom the Bell Tolls takes place in Ronda. If you've read it, then you know the scene in which the Fascist sympathizers are thrown off a cliff? Yup, that's Ronda. You see that path? Yeah, that's it. You see, falling off a cliff is a very real possibility in Ronda. Even more so once you start meandering down the shoddy donkey path that leads to the bottom of the canyon. Parts of it are wide and well-kept, but others…Well, just don't lose your balance. If you have any sense of adventure, you can't not go down this path. Here is where the view is best: to your right you have the bridge, which spans a magnificent waterfall; to your left, a beautiful countryside that stretches toward breathtaking mountains. And surprisingly, the view doesn't get any worse as you make your way to the bottom; rather, the canyon walls loom all around you, making the bridge seem even more impressive. Our view while eating lunch on a ledge. If you're feeling especially adventurous, you can enter an old cave that supposedly used to serve as a hide-out for bandits. There are also a few ladders you can climb and old buildings to explore, if you're so inclined. But actually, Gibraltar really is a great big rock. It's just a rock that happens to be an entire British colony. That's right. Gibraltar is part of the U.K., so for a few hours we left tapas and siestas behind in exchange for tea and biscuits, fish and chips, and bright red telephone booths! The adventure begins as soon as you cross the border. To get from passport control to the actual city, you have to walk across an active airfield. Don't get hit by a plane! After that, we clambered through an old tunnel, probably once part of a fortress, that dumped us right into the city. Unfortunately, we didn't have a lot of time, so we took the obligatory tourist photos and then hurried off to the cable car that would take us to the top of the rock. Oh yes, the cable car. On a scale of 1 to Sketchy, this cable car seemed pretty darn sketchy. But we didn't have enough time to walk up, so in we went. If you're afraid of heights, Gibraltar is not for you. Monkeys. Macaques, to be specific. I've never been a fan of monkeys, but I decided right then and there that I really don't like them. They're pickpockets and identity thieves, and if you don't give them what they want, they'll rip your face off. A minute after we stepped off the cable car we witnessed a showdown between a grown man and a monkey over the man's backpack. The monkey eventually threw in the towel, but then he came after us. Uh uh. I don't think so, Monkey. Try to steal my wallet, and I will pick you up and throw you off the cliff. There were monkeys everywhere. Sitting on the walls. Riding on the tops of cars. Climbing on people. As my roommate would say, "I ain't about that life." But there was no escape. They were everywhere, which meant I had to face them. Walking along the path down the mountain was like walking through a haunted house. You know the ones in which people jump out at you? Yeah, just like that. With every step, I had to worry that a monkey would launch itself at me. But it's one of those things that I had to do. Was I afraid? Sure, but I didn't cower behind my friends, either. In fact, there were points when I led the way. That didn't mean I was any less afraid; rather, I knew that I had to do this if I wanted to get back down the rock. At one point, our friend was attacked. She pulled out a muffin, and bam! A giant monkey appeared out of nowhere and threw itself at her. She tossed the muffin as he climbed up her body; he went after it, and we hurried away, only to mount the Platform of Doom. Imagine boat dock that juts straight out of the side of a mountain. Or a giant diving board. This was the midway station to catch the cable car. Yes, there were railings, but the platform below was made up rickety wooden planks that rattled as the cable car approached. I'm not afraid of heights, but my stomach twisted into knots as we waited. Looking up from the Platform of Doom. We want our characters to be brave. It's one of those traits that's usually required of a protagonist; otherwise, he'd never do anything, and there wouldn't be a story. However, everyone is afraid of something. 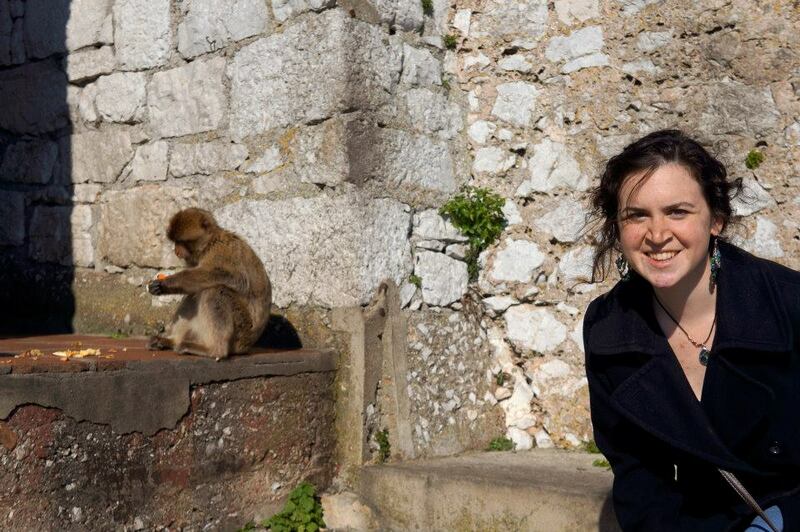 Turns out I'm afraid of monkeys. Some people fear heights. For others, its spiders that give them the heeby-jeebies. Honestly I think fear is one of the hardest feelings to write. At least, for me. It's one of those emotions that's as easy to overdo as it is to leave out completely, and finding the correct balance sometimes seems impossible. But I'm a writer, and writers are a little crazy obsessive. They think about writing all the time. Which is why I like to put myself in situations that scare me, whether its peering off the side of a cliff or passing through a wild monkey den: "Hey, I'm absolutely terrified right now. How does it feel? I can totally write about this later." That's as close as I was getting. This is my face of utter distress. Have you had any adventures à la Indiana Jones? What would your boggart turn into? Do you ever put yourself in unpleasant situations just so you can write about them later? Are you really terrified of monkeys? "Terrified" is a strong word. But they definitely freak me out a lot more than most things. Though granted, not a lot freaks me out. I guess it's relative terror.